The Niger Delta Forum Study Group (NDFSG) has completed the documentation on the vision and achievements of the first Military Governor of the Old Rivers state, King Alfred Diete-Spiff. 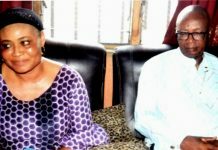 The NDFSG, a non-governmental organisation (NGO) involved in research, documentation and peace building, said in a press statement in Port Harcourt that Diete-Spiff’s biography will be presented to the public tomorrow at Hotel Presidential, Port Harcourt at a special occasion to be chaired by former Senate President, Dr. Joseph Wayas. 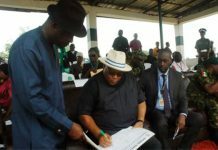 According to the statement, the book captures King Alfred Diete-Spiff’s vision as a leader who raise from a humble background in Nembe in the present day Bayelsa State, Bureau, Tiko Sasse in Cameroun to a very high level in his naval career, unbeaten political life as Governor at the age of 24, and his private adaptations in the private sector and civil society organisations. The statement recalled that the pioneer governor of the state selected the best brains as at that time to man the government of his administration and various government agencies and extra-ministerial departments towards actualising his vision for the state. It listed the landmark achievements of ex-governor Diete-Spiff which include the establishment of the College of Science and Technology (now a university), University of Port Harcourt, School of Nursing and Midwifery, College of Education, (now a university), teacher training colleges, School of Health Technology, State Secretariat among others which have impacted positively to the socio-economic and political development of Rivers State.